Recently I came across two hugely inspiring ladies who both live the “Zero Waste” life and after leaning more about them I couldn’t wait to share their message with you beautiful people. Bea Johnson – Zero Waste lifestyle expert , originally from France, today lives with her family in Mill Valley, California. She is the author of the bestseller Zero Waste Home. And then there is Lauren Singer -beautiful young New Yorker who documents her zero waste journey on her blog Trash Is For Tossers. Maybe you haven’t heard about the Zero Waste movement yet and might wonder what the heck is this all about? Well in short, Zero Waste is about rethinking our relationship with resources. It’s about changing our lifestyle in a way that we produce minimal amount of waste. Both Bea and Lauren managed to perfect this idea in a way that today they generate only about one mason jar full of waste per year! Now that really got my attention! 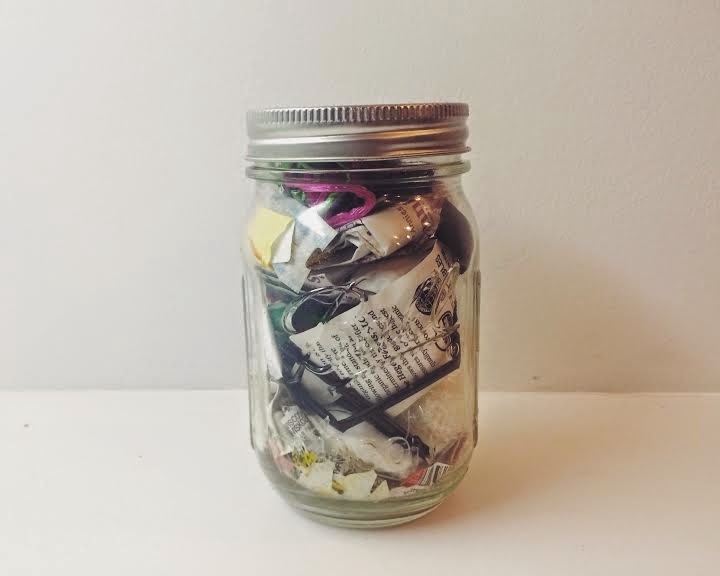 How does Lauren define ZERO WASTE? It comes down to these five Rs! As a plant based eater you have certain degree of awareness and connection with yourself, people around you, animals, nature and our environment. Many times our “wastefulness” comes down to lack of knowledge. For sure the idea of “zero waste” might seem overwhelming and our mind will create hundreds of excuses why “I can’t do that”. But before you disregard this concept altogether read the tips below and evaluate if you could apply a few (or all) of them to your daily life. Buy whole fruits and vegetables instead of prepackaged varieties: Pre-packaged apple slices, baby carrots or salad mixes may be convenient, but they are expensive and create a lot of unnecessary trash. Instead, opt to cut up your own apple or mix your own salad. Eliminate paper towels: This may seem drastic, but it’s really not difficult. Replace paper towels with rags for cleaning counters, mirrors and other household surfaces. Cloth napkins can be used in place of the paper variety, too. If you cannot find it in bulk, find an online supplier, also experiment with bringing your jar to the ice cream shop, a pillow case to the bakery for your bread, or your bottles to the winery/brewery… or make it from scratch (mustard, salad dressing, hot sauce, jams, OJ, hummus, cookies, tomatoes sauce). Shop the farmer’s market: they’ll take the berries baskets back for reuse. Your veggies will also most likely be free of plastic and stickers. Take your own mug to the coffee shop instead of getting a disposable cup there. Buy a set of inexpensive silverware, plates, bowls and cups and stop using plastic ones. As a plant based eaters we produce enormous amount of compost that often ends up in a garbage 🙁 Turn your trash can into a big compost keeper. Use bulk liquid soap as a dish/hand cleaner, baking soda as a scrubber with a compostable cleaning brush (a wooden one with natural hair). Refill your bottles with bulk shampoo and conditioner. For body/face soap, find a package-free solid soap. To exfoliate, use bulk baking soda. For a mask,use bulk clays (French, Kaolin, Bentonite, etc…), mixed with water or apple cider vinegar. Laundry washing once a week saves time and dryer energy costs, use a laundry detergent sold in bulk, full loads, and cold water cycles as much as possible. Dry on a line or rack when possible. Recycle unusual paper items: This may seem like a no-brainer, but do you recycle the inner cardboard tubes in a roll of toilet paper? What about receipts, price tags, straw wrappers and shredded paper? Submit all paper items to the “tear test” – as long as they tear like regular paper, you can recycle them. Stick to minimal wardrobes, shoes and purses. Only shop a couple times a year to avoid compulsive buying. Buy second-hand clothing and donate your unworn clothes. Keep some of your worn-out clothes for rags. Don’t buy- rent instead. You’d be amazed what you can rent these days. Items listed for rent in the Yellow Pages include appliances, audio-visual equipment, office furniture, party items, baby furniture, and medical equipment.Using rental shops saves you the burden of buying, storing and maintaining goods and equipment. I hope the above ideas will help you understand that Zero Waste lifestyle is simple, cost-effective, timely, and absolutely possible for everyone and anyone!